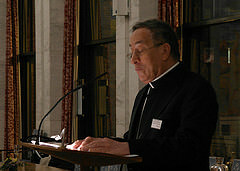 Cardinal Rodriguez speaking at the official anniversary ceremony of Caritas Norway. Cardinal Oscar Rodriguez Maradiaga was in Norway this week to celebrate 50 years of Caritas Norway’s service to the poor. We remember him especially in Caritas Internationalis. He was our founding father and his encyclical Popolorum Progressio continues to inspire our mission. Blessed Pope Paul VI said in that encyclical that peace is not just “the absence of warfare”, but the establishment of a “more perfect form of justice” among men and women. It feels particularly appropriate to repeat those words as we celebrate half a century of Caritas Norway and its work on behalf of the poor at the Oslo City Hall. Norway is celebrated for its role in brokering peace. It is also here in City Hall that so many remarkable people have come to received their Nobel Peace Prizes. And we are celebrating 50 years of Caritas Norway, a champion of peace and social justice throughout the world. Caritas Internationalis means ‘love between peoples”. Building peace has always been a cornerstone of our efforts. Caritas Norway has been a leading light, playing a key role in peace processes in Asia, Africa and Latin America. When it comes to the fight against poverty, Norway is a far larger actor than the size of its population would indicate. It should be applauded as one of the few nations which spends about 1 percent of its annual budget on foreign aid. In the same way, Caritas Norway is small in size, but has had great influence in the Caritas family. Caritas Norway helped develop our ideas on partnership and make it one of our central values. They helped pioneer our work on HIV and AIDS from the early days of the pandemic. They worked with Caritas organisations in Latin America to promote the role of women as driving forces in integral human development. In the countries where they’re present, Caritas Norway has a reputation for promoting human rights, democracy and the dignity of each individual. Thank you all for the effort you have put in to make Caritas Norway into the fantastic organistaion it is today, stronger than it’s ever been before. Congratulations on the 50th anniversary of Caritas Norway and God bless their work. 12/11/2014 Blog, Conflicts and Disasters, Europe, Norway, Peacebuilding by Oscar Andrés Cardinal Rodríguez Maradiaga, s.d.b.